Dear St. Nicholas, in this most holy time of year when we look forward to the celebration of the birth of our Lord Jesus Christ, help us to focus our minds on Him rather than on self-centered, worldly celebrations. Pray for us that we will take time to reflect on His Incarnation. And dear St. Nicholas, may we have a generous spirit like yours and a constant and abundant love for others. Amen. The children found many treats in the shoes they left out last night. 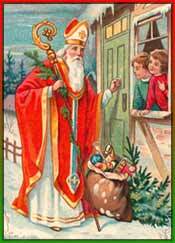 Check out St. Nicholas Center for other traditions and information about this great and holy man.